We’re Going BACK TO THE FUTURE! The folks at Consolidated Theatres are doing it again. They’re bringing my boys, Marty McFly and Doc Brown, back to the big screen in Back to the Future! 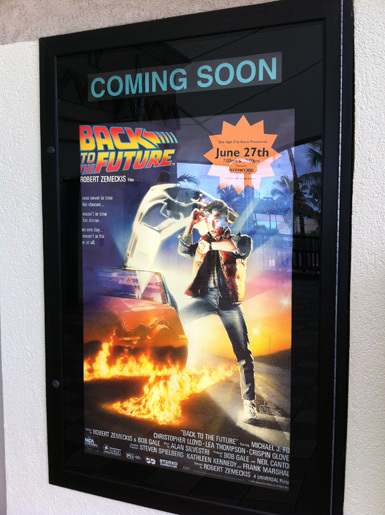 As with Top Gun last month, Back to the Future will be coming BACK for one night only, next week Monday, June 27 for two showings at 7pm and 10pm. If you missed out seeing Top Gun I highly recommend you buy your tickets online, and as soon as possible because as many found out last time…there was only front row seating when they showed up to purchase tickets right before the movie. I’ve got my tickets . . . do you? Hello? Anybody home? Think McFly, think! 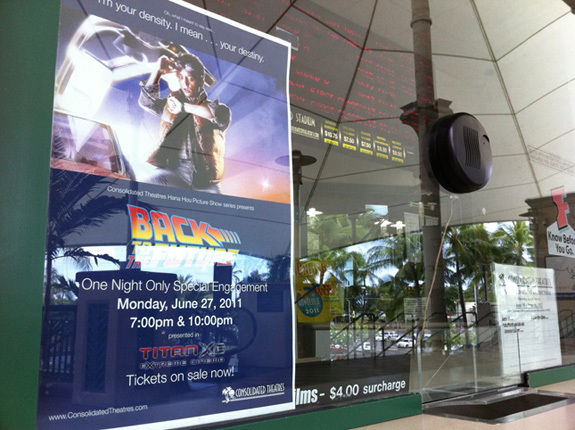 One of the displays outside the theater has a poster up for Back to the Future. Smaller tabloid sized posters are displayed inside the box office at Ward. If you’re interested in potentially winning free tickets to this special presentation of Back to the Future, 94.7 KUMU-FM is giving away tickets. Check out their website for more details.